Reasons to purchase this kit. Compared to your stock incandescent bulbs, these are about 3 times brighter making you more visible, day or night. Compared to your stock bulbs, these draw 50% of the power. Less power draw from your battery means less load on your alternator so you can run other electrical equipment or accessories. 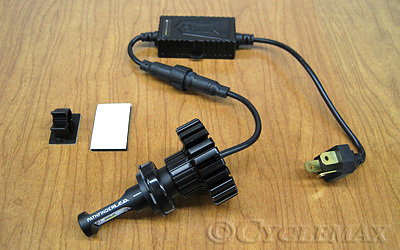 LED bulbs are INSTANT ON – They do not require any warm up time and they may be compatible with headlight modulators. Unlike other LED designs, our lights are non-directional. This means you will have a further and wider beam pattern compared to other LEDs on the market. These have a new passive cooling system, solid state design, no moving parts, no fans and no noise. Other cooling methods tested do not allow the heat to thoroughly dissipate, therefore causing premature LED failure. Although our LEDs have a long service life, we include a 1 year hassle free replacement warranty unlike other outlets that offer only 90 days. Our bulb is completely Plug N Play and includes everything you need to upgrade any one bulb in either your low or high beams.